James Galvin proved that a veteran is never too old to join The American Legion. 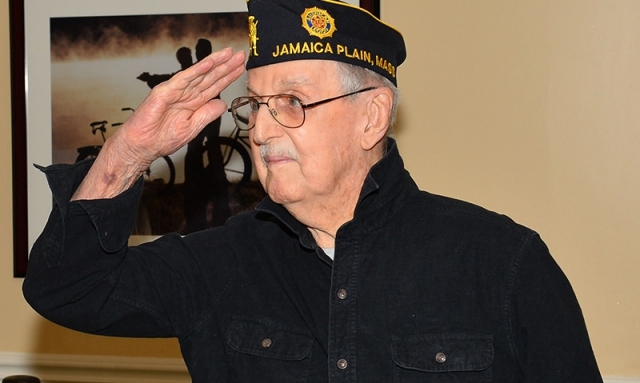 The 96-year-old World War II Army Air Corps veteran is now a member of Jamaica Plain (Mass.) Post 76. His induction ceremony was held a few months ago at Atria Marina Place in Squantum, where he is a resident, in front of those who wanted to honor his service – family, friends, elected officials and members of the Massachusetts American Legion Family. Past National Commander Jake Comer presented Galvin his new blue cap. “I always wanted an American Legion cap and now I have one,” Galvin told The Quincy Sun. Galvin served as a B-24 gunner with the Flying Horsemen of the 449th Bomb Group. His squadron flew 50 missions over Germany and France during World War II. Galvin is a recipient of the French Legion of Honor, the highest decoration bestowed in France. Department of Massachusetts Commander Mike Davis presented Galvin with a certificate of appreciation for his military service, and proclamations were delivered from Quincy Mayor Thomas Koch’s office and the Massachusetts House of Representatives, and a citation was offered by Councilor-at-Large and Sons of The American Legion Squadron 294 member Noel DiBona.